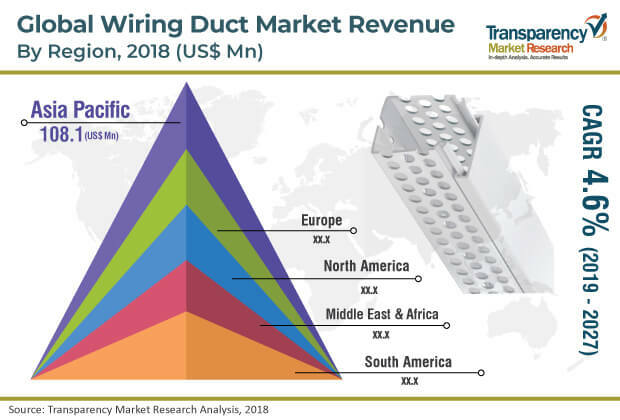 According to a new research report published by Transparency Market Research, the global wiring duct market is projected to reach value of US$ 524.3 Mn by 2027, expanding at a CAGR of 4.6% from 2019 to 2027. The global market is expected to be influenced by a range of macroeconomic and market-specific factors during the forecast period. Demand for wiring ducts is likely to be significant in Asia Pacific during the forecast period, owing to presence of a large number of unorganized players and easy availability of raw materials in the region. The market in the region is anticipated to expand at a CAGR of 5.2% during the forecast period. Wiring ducts are used in electric enclosures to help protect and route cables and wires. A wiring duct is a type of cable management product that allows routing of large-sized bundles of cables and separates them from raceway and other components. The term ‘wiring duct’ refers to a wire trough that easily allows for organization, pulling, and separation of cables. Often, it features a sliding cover and ‘fingers’ on the sides, which creates slots for cables to be added, removed, or re-routed along the length of the run. Openings on the slotted wire ducts feature rounded edges, which protect wires and hands from cuts and abrasions. Solid wire duct units protect sensitive cables and electric wiring from debris, dust, and other outside contaminants. Rising demand for eco-friendly, halogen-free wiring ducts is expected to create lucrative opportunities for the global wiring duct market in the near future. The global wiring duct market has been segmented based on product type, application, and region. In terms of product type, the market has been classified into slotted wire duct, solid-wall wire duct, flexible wire duct, and others. Furthermore, the slotted wire duct segment has been sub-divided into wide-slotted wire duct, narrow-slotted wire duct, and round-hole wire duct. Wide-slotted wire duct is the most common type used for cable management currently. Open-slotted wiring ducts are manufactured with wide fingers, which provides greater sidewall rigidity, giving additional cable support and allowing terminated wires to be re-routed easily. The restricted slot design retains wires in the slot so as to achieve rapid and easy installation or removal of wires. This is the key factor that boosts the demand for slotted wire ducts in IT, telecom, and data center industries. Rising demand for solid wire ducts for use in providing complete cable and wire protection for critical cables is expected to augment the wiring duct market during the forecast period. Based on application, the global wiring duct market has been categorized into commercial and industrial. The commercial segment comprises wiring ducts used in IT hubs, network cabling systems, data centers, telecom industry, office spaces, hospitals, and other retail complexes. The wiring duct market in Asia Pacific is expected to expand at a significant CAGR during the forecast period, owing to presence of numerous manufacturers in China and availability of raw materials at a low cost in the region. Asia Pacific is emerging as a manufacturing hub for low-end applications. Presence of developed countries in North America and Europe has made these regions mature markets for wiring ducts. On the other hand, developing countries in Asia Pacific and Middle East & Africa that are witnessing industrial and commercial infrastructure development and the corresponding development of power networks are driving the global wiring duct market. Countries such as China, Japan, and South Korea are also expected to hold significant shares of the market for wiring ducts in Asia Pacific during the forecast period. The wiring duct market in China is likely to expand at a CAGR of 5.4% from 2019 to 2027. The research study includes profiles of leading companies operating in the global wiring duct market. Market players have been profiled in terms of attributes such as company overview, financial overview, business strategies, product portfolio, and recent developments. Key players operating in the global wiring duct market are ABB Ltd, Hager Group, Panduit Corporation, Hua Wei Industrial Co., Ltd., OMEGA Engineering, Inc., Phoenix Contact GmbH & Co. KG, and Hammond Manufacturing. Companies are focusing on expanding their business through strategic acquisitions and partnerships with several end-use industries.